What does the shape of a Croissant mean? Some croissants are straight while others are crescent shaped…. but does it MEAN anything, or is it just decorative? Turns out France actually has laws about what each shape indicates. According to Everywhereist, in France, only all-butter croissants are legally allowed to have a straight shape (as seen below)! Any croissant, even those made with part margarine or other oils, can be crescent shaped. There’s your strange fact for the day. Legend has it, if you find the toy inside the King Cake (or Gallette des Rois: recipe here) on Three Kings Day on January 6th, you become king or queen for the day. The classic king cake trinket in the US is a plastic or porcelain baby, though it was traditionally a fava bean (la fève in French). Now the term “la fève” has come to refer to any kind of trinket that may be found inside the cake, and may be any assortment of tiny characters, foods or animals (though some bakeries in the US are doing away with them altogether). There is something of a collectors market around particularly artistic or rare fèves, and their collectors are called “favophiles.” We came upon a particularly cute assortment of fèves at La Fournette bakery in Chicago, they may just entice us into becoming favophiles. We are always on the hunt for delicious baked goods, and other than the perfect macaron, one of our most elusive quests is for the perfect croissant. We have had many good croissants, but they all seem to lack the light flakiness we so desire. However, we may have just found one of our favorite croissants at a small bakery in Pilsen: Beurrage (1248 W 18th St). Beurrage is the brainchild of Jeffrey Hallenbeck, a self-taught baker, who developed the business out of a catering company. Beurrage has a variety of croissants available, from almond to chocolate to hazelnut banana to savory varieties. In a Chicago-y twist, there is even a pretzel croissant! For their generous size, we were also shocked at the reasonable prices ($3.50 for a pain au chocolat / chocolate croissant). We went with the chocolate croissant – and were completely delighted at how light and flaky it was. We’re talking shatter-into-a-million-flakes-upon-biting flaky. There was also a generous filling of dark chocolate, we hate when bakeries skimp on this, so we were in heaven. Of course, Beurrage also sells other things than croissants, like doughnuts, cinnamon rolls and danishes. However, with a croissant that good, who needs variety? We will be returning ASAP to stuff our faces with more croissant-y goodness. We have longed for a nice cafe in Evanston that sold delicious pastries and coffee for a while now. There are places that satisfy one need or the other, but now we have Patisserie Coralie (600 Davis Street, Evanston) to help us out with both! Coralie is located in the former home of Cafe Mozart, and more than fills the long-vacant spot. Coralie is the brainchild of Pascal Berthoumieux who also owns the Evanston restaurant Bistro Bordeaux (the patisserie is named after his daughter). Inside the cafe, there are some comfy couches and chairs as well as a small counter by the window and some wooden tables, and we appreciated the nice touch of the chandeliers. They seem to be pretty much constantly busy, which is good for them, but means that it is always pretty crowded! When we arrived, every seat was filled, and we were lucky enough to snag two counter spots that opened up just in time. Coralie serves Julius Meinl coffee, and a variety of coffee drinks both hot and iced prepared by very nice baristas. The chai tea latte is also quite tasty for those who prefer to go coffee-free. Though Julius Meinl coffee is always a plus, the true treats are the pastries, courtesy of pastry chef Manuel Bouillet. On our initial visit we tried an excellent eclair and a perfectly flaky pain au chocolate. At this point in October, they were not producing macarons yet – “they’ll be here in November” was the response. True to this promise, we visited on November 1st, and there we found a delicious assortment of macarons! We tried the coconut milk chocolate and passion fruit (though the raspberry also looked particularly tempting) and were really impressed. On our second go-around we were also truly excited to try one of chef Bouillet’s signature desserts – which was especially enticing on appearance alone – the “Exotic egg,” which true to its name does look like an egg! In this concoction, vanilla cream is served in a white chocolate cup with a “yolk” of passion fruit gelee. The egg cup is then balanced on a chocolate sable cookie. We really enjoyed the combination of vanilla and passion fruit and the unexpected crunch of the cookie. Each time we visited Coralie, there was a wider variety and quantity of pastries and desserts on offer, and an ever-growing crowd. We are glad they are ramping up production to meet demand! Coralie definitely satisfies a unfilled need in the Evanston cafe scene. We look forward to visiting again soon to satisfy our pastry cravings, and we are even prepared to wait. We have a major obsession with macarons, and we ranked the macarons at Ladurée in Paris as our favorite. So how excited were we two weeks ago to be visiting friends in New York, home of a North American outpost of our favorite macaron purveyor. The Ladurée in NYC is on the upper east side (864 Madison Ave, New York, NY 10021), within a stone’s throw of the Whitney Museum. We went on Saturday afternoon expecting a line… and we got one. However, the crowd control was a bit more organized than the Paris location. Here in NYC, there was a bouncer to let only 20 people into the shop itself at a time. It took us about 20 minutes to get to the counter to order, and once we were there, it was only minutes until we were reunited with our macarons. The store was just as picturesque as the original French outpost, all done up in pastels, with mirrored cabinets and little towers of macarons perched on ornate boxes. In addition to macarons, the store was jam packed with chocolates, jam, ice cream and even coffee. Of course, there was also a huge selection of food and trinkets emblazoned with the Ladurée logo. Yet as always, we were single minded in our mission. After the bouncer let us pass, we swarmed the macaron counter, which boasted over a dozen varieties, including our perennial favorites chocolate and salted caramel. As in Paris, the flavors are displayed on a little graphic menu, as displayed at the bottom of the post. There were other classic flavors including pistachio, coffee, lemon, raspberry and strawberry, as well as some more esoteric varieties including orange blossom, black forest and the quixotically-named Marie Antoinette (Earl Grey tea, though the macaron itself is blue). It was a steep $21 for six, but we felt it was worth every penny, as we indulged in our macarons on a bench in Central Park. The salted caramel and chocolate were also a big hit with our friends, and we are happy we brought over some new macaron addicts to the fold. Word on the streets is that there is now a Ladurée in Soho (398 W Broadway, New York, NY 10012) with a tea room. Maybe that will be our next macaron mission (if we can get past the bouncer). Our favorite April Fools’ tradition is the French Poisson d’Avril (April fish), where you are supposed to go around taping paper fish on the backs of friends and acquaintances. We learned that Italy has their own version of this holiday, Il Pesce d’Aprile! However, in both countries, the “fish” means the appearance of fish-shaped chocolate as well. Of course we approve of any holiday where chocolate eating is sanctioned. King cake is commonly eaten on Epiphany, January 6th, and whoever finds the trinket (la fève) in the cake (sometimes ceramic, or sometimes edible, like a fava bean) is king/queen for a day. However, it is fashionable in Paris to serve it long after that, and perhaps this tradition holds in Chicago as well, since we still saw it on offer in Mid-January. The French Galette des Rois is made with puff pastry and filled with almond cream. David Lebovitz has a recipe to DiY, though we think it’s nicer to pick one up at the bakery (and the crown that goes with it). It is particularly appropriate that I am writing this review of a little French bakery while listening to Julia Child’s “My Life in Paris” (so she’s not a pastry chef, but still…) We happened upon La Fournette after a trip to the Chicago History Museum, and we were pleased by the quaint ambiance and the large variety of baked goods. We were a little taken aback that we were greeted with a chipper “Bonjour” upon entering, but in the best possible way. The bakery itself is long and narrow, with wooden tables at one end, and a very long glass counter at the other (you can even do a tour on Google Maps). “Fournette” means little oven, so it is no surprise that the specialty of the house is the delicious bread. We sampled some of the house specialty bread, a dense sourdough called “Miche La Fournette” ($6.95 for a 2 lb loaf). There was a large selection of attractive carb-y delights piled on the baking racks. The Provençal Olive Fougasse bread ($5.75) looked particularly appealing, and who could go wrong with a classic baguette. The chef is from the German-influenced French region of Alsace, so that unique culinary heritage is also present in the bakery – they even have Bretzels ($2.15)! Of course we also made a beeline for the sweets. 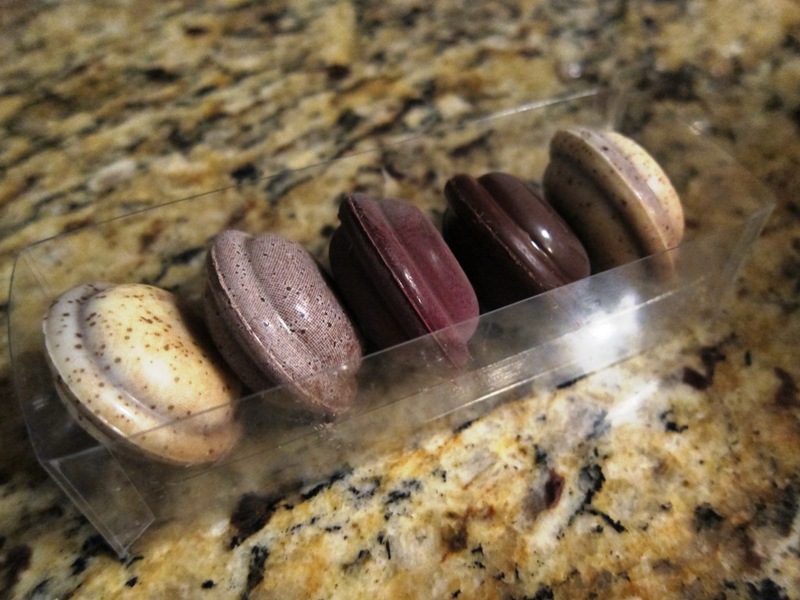 There was a pretty decent selection of macarons ($1.80), from which we ordered a chocolate and passion fruit/mango. The chocolate was a little flat but the fruit macaron was light and delicious. We were a little disappointed to find the financiers and madeleines pre-wrapped, but we were reassured that everything is made in-house. For something more substantial, there are a rotating selection of soup and sweet or savory crepes. M selected a bacon lentil soup, which was very warming (and very bacon-y). There is also a small drink menu from which we ordered some chocolate chaud, or hot chocolate. It was not too sweet (which we like) and perfect for the freezing weather. Perhaps a cafe au lait some other morning? One of the key features of the cafe that we enjoyed is that you will find people actually talking to each other, not just working on laptops, as you see in most other cafes. We highly enjoyed our relaxing afternoon snack and the convivial atmosphere, and we hope to get there earlier another morning so we can sample the croissants and brioche that had long sold out by the time we arrived. Moreover, we are looking forward to visiting the outdoor cafe portion in more friendly weather. The ever-exciting Next Restaurant has moved on to their newest menu: a tribute to Bocuse d’Or, a prestigious biennial international cooking competition in Lyon, France. Check out the official trailer for the menu below. So what can we expect from Bocuse d’Or? The menu, running through December has 15 courses and is decidedly French, with canapes, veal terrine and pheasant dishes. Micheal Gebert has a fascinating behind-the-scenes photo series on all the prep involved in putting together the Bocuse meal at Next. For those want another look at what diners can expect, photographer Emilia Jane has a complete photo series of the dinner menu. Beautiful presentation and original food from Next as usual! The most famous Bull-fighting festival in the world may be in Pamplona, but the gigantic Fêtes de Bayonne in the Basque region of France features not only bull-fighting, but a festival dedicated to omelettes (Championnat du monde d’omelette aux piments) at the end of every July. Indeed, there is an championship for nearly everything, and this one has been running since 2004. One of the most emblematic foods of the French Basque county, Omelettes aux Piments (Omelette with Peppers) is an egg dish with potatoes and the famous sweet Espelette peppers (piments doux in French or Ezpeletako bipera in Basque). Espelette peppers are a mild red pepper originally from Mexico, and were brought to France in the 16th century, but they are so much a part of Basque cuisine that they have governmental status as a protected destination of origin product. In the town of Espelette, it is not uncommon to see large strings of Espelette peppers drying in the sun. French Basque Country, which is in Southwestern France, and shares a border with Spain, is known for their unique cuisine, and the Omelette aux Piments marries both the Spanish and French influences (classic French egg omelette and Spanish tortilla). Eat Live Travel Write has a wonderful write-up of the entire Bayonne Fest, along with coverage of the Omelette Championship. The Chopping Block has an omelette recipe calling for Espelette peppers. Another use for Espelette peppers is in Piperade, a typical French Basque condiment used on almost anything. A pastry created for Brigitte Bardot – sounds decadent! The duly sumptuous Tarte Tropézienne, from the French riviera town of Saint-Tropez, really does have a glamorous origin story linked with the star. 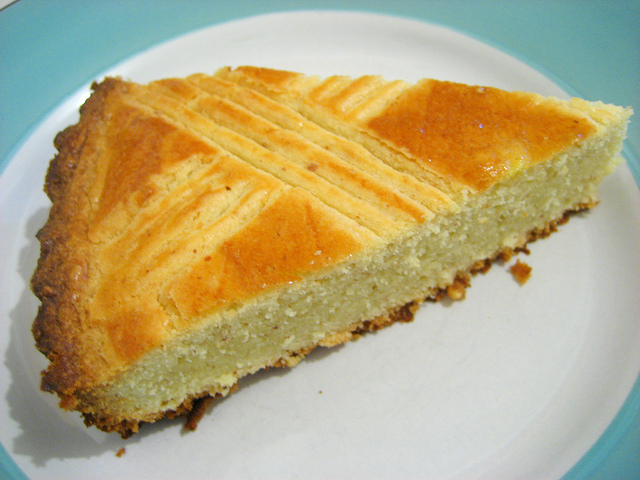 Tarte Tropézienne is a brioche-like cake filled with vanilla pastry cream and topped with pearl/rock sugar. I like the idea of making a Tarte Tropézienne – it is basically a giant brioche roll, sliced open and filled with cream. The confection was developed in Saint-Tropez in the 1950s by a local pastry-maker of Polish origin, Alexandre Micka. When the 1956 film “And God Created Women,” the film with the breakout role that made Brigitte Bardot a star, was being filmed in Saint-Tropez, director Roger Vadim hired Micka as a caterer for the film. The cast and crew, including Brigitte Bardot, fell in love with the cake, and according to myth, it was Bardot suggested the naming the cake for the town. Micka did just that, and the rest is history. The Tarte is still popular all over the French Riviera, evoking movie star glamour of days past.